Today we are facing yet another bomb cyclone. We won’t know the impact it has had to wildlife until it is over. In early January, one of the worst cold snaps in years hit Florida. Temperatures lingered around freezing in Brevard County, which is home to many Florida manatees. In a canal in Satellite Beach, nature fought back against the cold – in the form of hundreds of Florida manatees cuddling together for warmth. Manatees need warm temperatures and can go into shock or die if water temperatures drop below 68 degrees for extended periods of time. With air temps in the 30s, the manatees were in trouble. 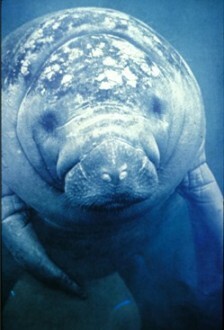 The Florida manatee was first listed as “endangered” under the Endangered Species Act (ESA) in 1991. There were an estimated 1,267 manatees in Florida at the time. In 2016, they were downlisted to “threatened” status and it is believed there are 6,300 manatees in Florida today. This should be a great success story and attributed to: the U.S. Fish and Wildlife Service and its use of sound science; the public and its increased concern for manatees as they were educated regarding their plight; and activists that demand the ESA stay strong and be implemented robustly. Unfortunately, the Florida manatee faces new threats which may plummet their populations again. Human activities landed manatees in crisis in the first place, with boat strikes still a leading cause of death but now manatees also face deadly algal blooms that destroy their food and extreme weather caused by climate change. Extreme weather events are becoming more common and more stressful. In 2017, Florida experienced powerful hurricanes, and just this past January – extreme cold. Scientists say the January winter “dipole” is a system that warms the West and freezes the East. It tends to happen when a ridge of high pressure sets up over the western United States, even as a low-pressure trough sets up over the east. Research suggests that the dipole is becoming more common in concert with greenhouse gas emissions. As the scientists do their research, the “bomb cyclones” could intensify going forward. What we know is that carbon dioxide and other greenhouse gases are causing climate change, which causes extreme weather occurrences and extreme weather puts Florida manatees in jeopardy. If you want to help Florida manatees, call your local, state, and federal lawmakers and tell them to protect the Endangered Species Act and introduce laws to reduce carbon dioxide and other greenhouse gas emissions now. Tell them this is a vitally important issue to maintain constituent support. And consider joining the Endangered Species Coalition to help us further efforts to protect the Endangered Species Act and the wildlife that depends on it.